Monarchs have interested me ever since I was a child chasing the orange-and-black butterflies through my Chicago backyard. Like many people, I’ve noticed there are far fewer monarchs around these days. Conservationists warn that monarch populations could soon dip so low that they won’t recover. Habitat loss is the main culprit: Monarchs only lay their eggs on milkweed, a plant being chased from U.S. farmland. 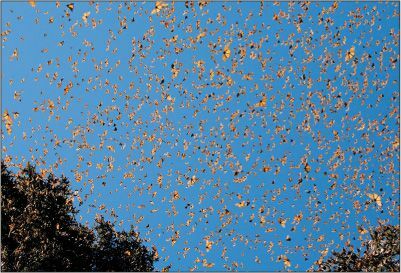 Meanwhile, illegal logging threatens the butterflies’ wintering sites in Mexico. That’s why I felt so grateful to get to El Rosario while it’s still a monarch mecca. To reach the reserve, we rode horses—a good thing, because I was hit hard by the 10,000-foot altitude. Our excitement built as we came upon a sunlit opening in the forest occupied by dozens of fluttering monarchs.